Our student newspaper is written and produced by Silver Oak Student Council. Click on the dates listed below to read each issue of our Sabercat Post. There is a new newspaper at school! The Silver Oak Sabercat Post debuted on December 1 with its first issue. Written for students by students, this new newspaper is a way for students who don't read online to see what's going on at school. To read the first edition, please click the story headline. Learn more about the Silver Oak Sabercat Post in this interview with Katie L. and Melanie, newsletter contributors, to find out more about this exciting endeavor. 1. Why do students need a newsletter? Katie - "I wanted to show events around the school, and even though there is a school website, most kids don't go on it. It's more for parents." Melanie - "It's a nice way for students who don't read online to see what's going on at school." 2. Who came up with the name of the student newsletter? Melanie came up with the newspaper's name. It has been Melanie's dream since 4th grade to write a school newspaper (she's in 5th grade now). Her first idea when thinking of the newspaper last year was the title because she thinks it is an original name. 3. Who writes for the newsletter? There are a handful of students in 4th-6th grades who write for the paper. Katie writes current events, Malanie writes a Q & A section, Rishik and Aaditya write Fun Facts, Spencer writes sports, and Angad and Rishik are the editors. 4. How is the newsletter distributed? Every teacher received a printed copy to display in their classroom. They were encouraged to put it on their white board and go over it with their class. Current and past issues of the newspaper can be read on the school website under the Our Students tab on the Sabercat Post page. 5. How frequently will it be published? 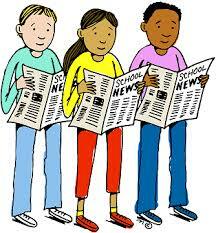 The newspaper will be published monthly, normally on the first school day of the month.